The hull of the ship to be named L’Astrolabe in Crist SA yard’s dock just prior to start of the dock flooding. French buyer – Concarneau, France, based Chantiers Piriou yard. 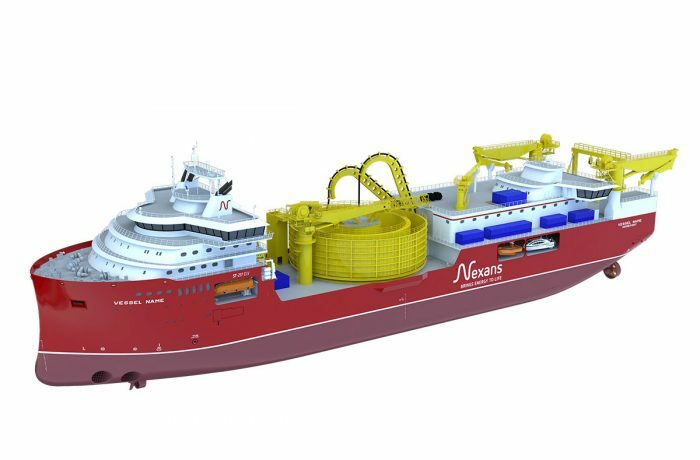 The ship (C325) is to be named L’Astrolabe and has been delivered by Gdynia based Crist yard outfitted to the high extend (at estimated 80% of technical readiness). L’Astrolabe is an icebreaking Polar Logistic Support Vessel (Navire Logistique Polaire or PLV) to be used to bring personnel and supplies mainly to the Dumont d’Urville Station in Antarctica. The PLV should be based on Reunion island and is expected to be shared between the French Southern and Antarctic Lands (TAAF) administration, the French National Antarctic Program (IPEV) and the French Navy. Reportedly – since the Chantiers Piriou shipyard is fully booked with ship orders from the French Navy, the construction of the hull was subcontracted to the Polish shipyard. The production of the vessel began on 16 December at Crist SA yard in Gdynia, Poland. On 22 December 2016, approximately one year later, the vessel was floated out from the dry dock. However towage to France has been delayed due to harsh weather conditions, including hurricane winds. 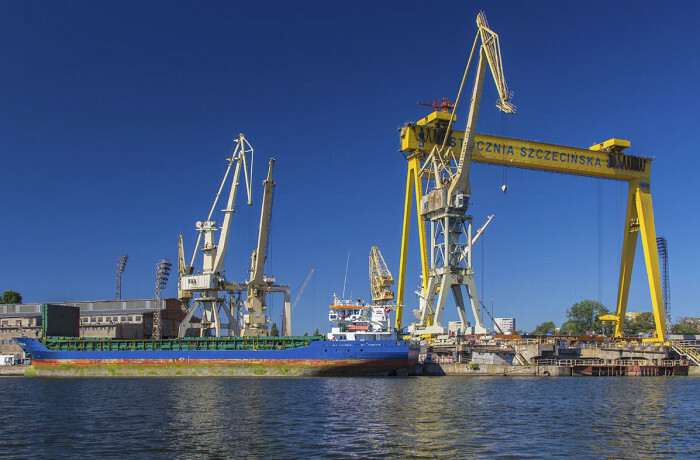 The towed hull left the port of Gdynia shortly after Christmas. 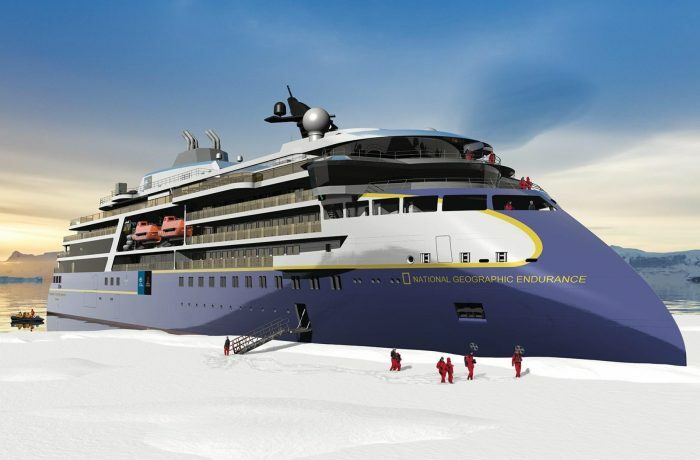 After final outfitting in France, the ship is scheduled to be delivered in the summer of 2017. The ship is expected to sail to the Indian Ocean in autumn 2017 and the Antarctic Ocean in the winter 2017 for a first refuelling campaign of the French polar bases. The new polar logistics vessel is 72 metres long and 16 metres wide, making the new L’Astrolabe somewhat larger than her 66-metre predecessor. The vessel can carry 1200 tons of cargo and has accommodation for up to 60 personnel, which includes the crew of the vessel. She can also accommodate a helicopter below deck. L’Astrolabe is powered by four Wärtsilä 20 series diesel engines driving two stainless steel controllable pitch propellers. The vessel will also be fitted with selective catalytic reduction units to reduce NOx emissions and comply with IMO Tier III emission regulations. 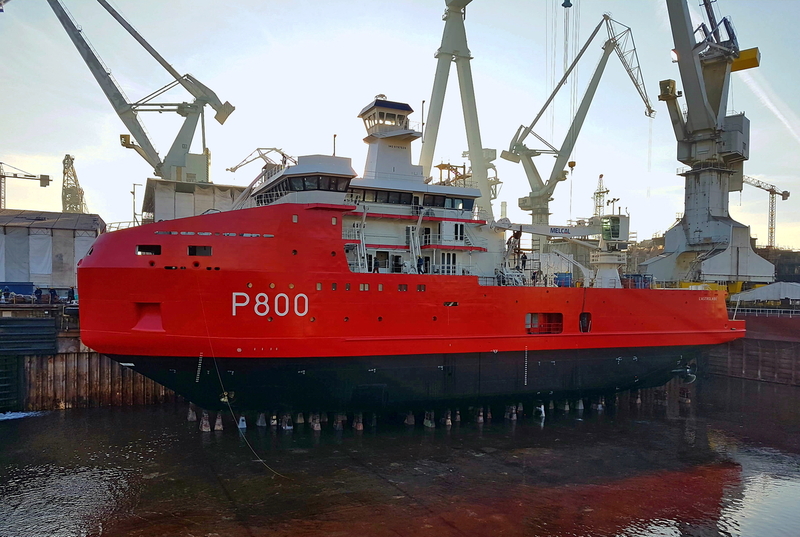 The polar logistics vessel is classified by Bureau Veritas. Her ice class is Icebreaker 5. Below: The partially outfitted vessel itself and the initial part of the launching procedure shown in a video.